Powerful cancer fighting nutrients you can grow in your home! 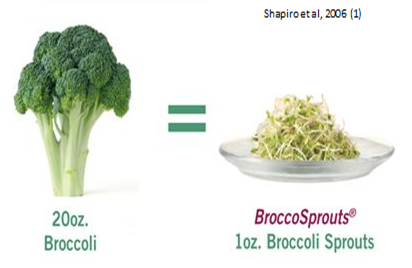 How much broccoli can you realistically eat? What if you could obtain the same amount of cancer fighting nutrients by consuming one ounce of broccoli microgreens vs. 20 ounces of the adult broccoli plant? Eating nutrient packed microgreens such as broccoli and many other microgreen varieties give true meaning to the quote by Hippocrates, “food is medicine.” Are you ready to learn how you can grow some yourself? If I can grow them, you can grow them! You can’t get more local than growing food full of nutrition right in your own home! The local food movement encourages us to buy produce from our farmer’s market, ask the farmer’s about how they grow their food (sustainable, with or without pesticides and herbicides, etc. ), start a small backyard garden, or even try to grow some herbs and lettuce in pots. Here is a great next step to help you connect healthy food to a healthier you. How about trying out growing microgreens right in your own home? About a year ago I stumbled upon a little plastic clam shell package of microgreens while shopping at Trader Joe’s. I purchased this 1.5-ounce package for $3.99. The taste and crunchy texture were awesome! However, the price for such a tiny amount of microgreens seemed a little nuts to me. Right away I looked into the supplies to grow microgreens myself. I picked up a spicy microgreens mix, two seed starting trays (one with a perforated bottom and one with a solid bottom) and a bag of organic soil mix. I grew a 10 inch by 20 inch tray of microgreens for a fraction of the Trader Joe’s cost and while the purchased version of microgreens was good, mine were so fresh and, well, even better! Since that first tray, my husband, Craig (the one with the REAL green thumb), jumped in and perfected our technique. We have been growing and harvesting microgreens ever since. You can watch a video I made on how to grow microgreens at home. The link is at the bottom of this blog. What’s the deal with “local” produce? Lately, we are more concerned with the nutrient content of our food. The nutrient content is declining over time. A USDA study published in 2004(1) found “statistically reliable declines” for 6 nutrients in 43 different garden-type crops. The nutrients with significant declines were protein, calcium, phosphorus, iron, riboflavin and vitamin C. One reason for this decline was suggested as changes in cultivated varieties to grow more food. In other words; the old seeds have been replaced with new seeds that will grow more and bigger produce, but the nutrient content is poorer. More is not always better. Another thought behind the decline in nutrient content is soil depletion of nutrients due to current farming practices where the same crop is grown on the same soil year after year. Tilling, which disrupt the soil microbiome is also thought to contribute to soil that is poor in nutrients. (2) If the nutrients are not in the soil they cannot be absorbed through the roots into the plant so, then, we eat produce that has less. Here are ideas to help increase nutrients in the food you eat . . . . . . When possible, buy local food and eat seasonally. One of the best advantages of local food is the higher nutrient content. Once produce is harvested it begins to decline in nutrient content by about 50% per day; the fresher the food the higher the nutrient content. Buying local food limits the amount of time by days for food to reach your table. One study in Iowa found that locally grown produce traveled an average of 56 miles from farm to point of sale, compared to an average of 1,494 miles for 30 types of produce from conventional sources. (3) Another option to eating food with higher nutrient value is to buy frozen food that is often flash frozen near the point of harvest, helping to retain nutrients. You can’t get much fresher than your own back yard or kitchen counter! Growing food in a small backyard garden or microgreens on your kitchen shelf helps ensure fresher, more nutrient dense produce! Buying local produce, starting a small garden and growing microgreens are three examples of steps you can take to increase nutrient intake for you and your family. What exactly is so great about microgreens? 1. Sprouts are germinated seeds eaten as the entire plant (root, seed and shoot); sprouted using water. 2. Microgreens are about 1-2 inches tall, eaten as the cutoff shoot only. These are harvested when the first true leaf stage is formed. 3. 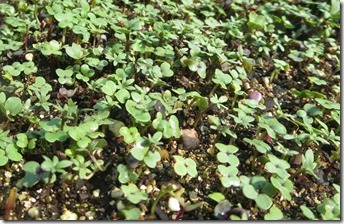 Baby greens are the oldest of the immature plants at about 3-4 inches tall, and a bit tougher than microgreens. · They are nutrient dense. Microgreens have at least all, and in some cases more, nutrients that the adult plant in a tiny package. Plus, you can easily eat more of them than the adult plants. · Microgreens are high in vitamin C, beta carotene, phenols, antioxidants and anthocyanins. · The most nutrient dense varieties are red cabbage, cilantro, red amaranth and daikon radish, but, there are many benefits to other varieties such as the broccoli microgreens mentioned in the introduction above. · Edible garnish and fun salad ingredient. 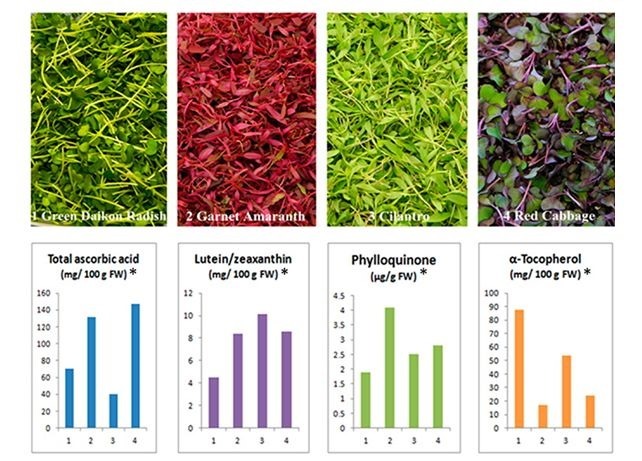 Notice the vivid colors in the diagram below of four recently studied microgreens. Also notice the levels of vitamin C, lutein/zeaxanthin (important for eye health), phylloquinone (powerful cancer fighter), and alpha-tocopherol in just 100 grams of these microgreens. (4) Microgreens are a great example of food as medicine. Other specific nutrients such as the big cancer fighter sulforaphane are found in the cruciferous vegetables like broccoli, Brussels sprouts and cabbage. 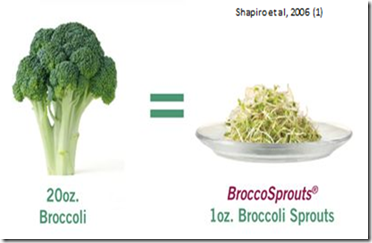 Sulforaphane is a heavily studied microgreen nutrient. Are you ready to grow microgreens and toss a handful on your salad ASAP? Note: are you one of those “if some is good then more must be better,” types? Many of us are so do not be ashamed. We all just want to feel better, be our best and turn back the clock if possible. However, researchers have looked into what level of the beneficial nutrients (namely sulforaphane) in broccoli becomes a toxic level, as an example. (1) About 4 cups is the maximum tolerable level before becoming toxic to the liver. Better yet, take a good look at the diagram above. 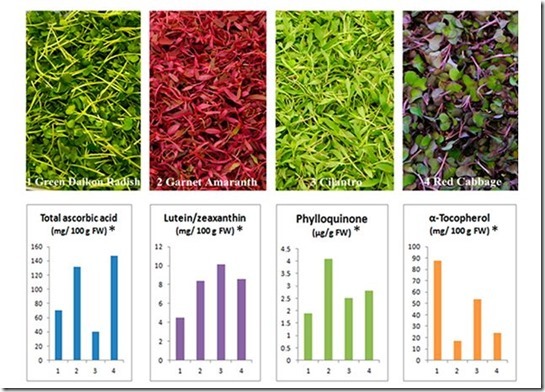 Notice the varying levels of nutrients in the four tested microgreen varieties. A good rule is to consume a mix of microgreens so we can benefit from a wider range of nutrients. What do I need to get started growing microgreens at home? Here is a list of equipment and some resources to help you get started. Here are two online companies we buy our supplies from. I have provided links to them below. The seed mixes from Botanical Interest are my favorite for flavor and consistent growing and because they are GMO Free. I like the kits from True Leaf Market. Some people like True Leaf Market hydroponic growing mats and they have a nice selection of seed (some organic). A good printed reference would be Microgreens: A Guide To Growing Nutrient-Packed Greens by Eric Franks and Jasmine Richardson. · Seed starting tray with holes (perforations) for drainage to avoid mold and seed rot. · Organic seed starting mix (Jiffy works great). You can ask for it at Lowes and Home Depot (they recently got some down from the top shelf winter storage for us). Or, you can order this online from Mills Fleet Farm. · Seed mix; my favorite is Botanical Interest (savory and spicy). I like using commercial mixes so you get similar growth rates for harvesting. · Filtered water or at least dechlorinated water (let tap water sit in an open container overnight). 1. Spread 1-2 inches of seed starting mix in the tray with holes. 2. Set the tray with holes into the solid tray. 3. Wet the seed starting mix until moist using a spray bottle or kitchen sink sprayer. This may take up to 2-3 cups water. 4. Evenly spread seeds over seed starting mix (use amount recommended by package to start with and then adjust with practice). 5. Dust seeds with about 1/4 inch seed starting mix, then mist with water. 6. Loosely cover with plastic wrap so water condenses on plastic wrap. 7. Keep moist, but not soggy and check daily. If using the dual tray method, add some water to the bottom tray and allow it to soak up thru the seed starting mix. Overwatering can be mitigated by dumping the bottom tray if the seed starting mix becomes too saturated. 8. Remove plastic wrap once seeds sprout. 9. Place tray near a sunny, well-lit window or under grow lights (more light increases nutrients). 10. Harvest at ~1-3 inches tall, over a period of 3-5 days or all at once. Rinse harvested microgreens with water, lay them on paper towels to dry (or a clean dish towel) and store in refrigerator in a sealed container or bag. Here are a few additional items for you to consider. 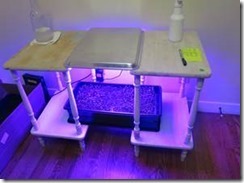 · Use hydroponic grow mats instead of seed starting mix as an option. · Use grow lights, especially if you don’t have an area with good sunlight exposure. · Keep a spray bottle of water handy to mist your greens, especially on hot days. · Make your own creative seed mixes once you have some practice with the packaged versions. 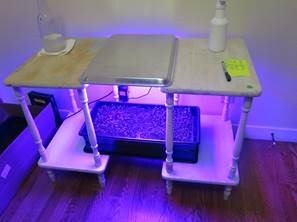 Below is an example of my neighbor’s kit from GrowingMicrogreens.com using the hydroponic mat. They found two end tables at a garage sale and added growing lights for their microgreen set-up because they did not have a sunny window for the microgreens. You can see how you will find a way to individualize your growing method. Enjoy growing microgreens. Please share your thoughts and experiences in the comments section below. Remember, you can watch my video on growing microgreens HERE. For my microgreens FAQ click HERE. For a list of references I used for this article click HERE. How much will 1 tray provide? One large 10” x 20” tray will provide approximately 3 quarts of cut mixed greens (realize that different greens grow to different heights and different densities). For example, parsley is a tiny and thin little microgreen where sunflower seeds are sturdy, tough and grow taller. One 5” x 5” sample kit will provide about 1-2 cups greens. This is enough to split four ways for a family of four as a hamburger garnish, for example. 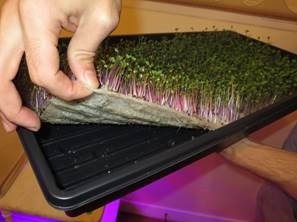 Microgreens need light to grow. Otherwise you will end up with a very inconsistent growth pattern. Make sure you place your microgreens near natural light in the window; a south or east facing window is best. Rotate your greens. You will find that they “reach” for the light and will literally bend toward the window. Some people decide to invest in special growing lights. 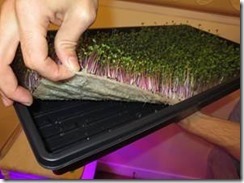 While these are not required, you might consider getting growing lights if your window light isn’t very good, or you decide you want to produce more microgreens on a continuous basis. During warm weather (> 65 degrees) you can set your microgreens outside. They will likely require more frequent watering outside as they will dry out faster. How do I know when and how much to water the microgreens? How often should I grow microgreens? This is individual based on the size of your family and how many microgreens you want to produce. We like to have fresh greens on an ongoing basis so as one tray is almost ready to harvest we start another one. For two adults at our house we like to have at least one 10” x 10” tray for harvest and one started at all times. What is your favorite microgreen? My favorite seed blend is the Spicy Mix by Botanical Interest. I think it grows the best and tastes the best. My favorite individual seed flavor? Well, that is a tough question! I like the spicy bite of mustard and red daikon radish, but I really like the crunch and nutty flavor of sunflower seeds. Should I use fabric mats or dirt for growing microgreens? This is another individual decision. We use dirt and feel that we get more robust microgreens than we do with the fabric mats. However, I know people who successfully grow on the fabric mats and use fertilizer. The mats are obviously less messy, but I don’t mind a little bit of dirt. This is really your choice. Are there any cautions about using microgreens? People with a compromised immune system (elderly, infants, children less than age 5, pregnant women, those undergoing cancer treatment, HIV infected persons) should be cautious about microgreens. These populations can still use microgreens, but researchers recommend sterilizing the seed and dirt (or use the fabric mats). For high risk people raw sprouts should be avoided. If in doubt ask your medical provider before consuming microgreens. Always use clean growing trays and equipment. Sterilize dirt by placing it on a large baking pan. Add enough water so the dirt is moist, but not soupy. Heat the dirt in a preheated oven (200°F) until the temperature of the center reaches 180°F (use a meat thermometer to measure). Cool completely and use. There are many methods to sterilize seeds. University of California-Davis recommends this technique: treat seed by heating on a stove for 5 minutes in a solution of 3% hydrogen peroxide (available in drug stores and pharmacies) at 140°F. It is important to maintain this temperature using a clean, accurate cooking thermometer. Exceeding this temperature may damage or kill seeds resulting in poor germination. Remove seed and rinse under running room temperature water for 1 minute. Discard the hydrogen peroxide solution and do not reuse. Do I have to use filtered water? Chlorine is removed from filtered water. Tiny plants do better with limited or no exposure to chlorine. Another method is to let tap water sit in a container on the counter overnight with the lid off. Most or all of the chlorine will evaporate off. We use filtered water that removes more than just chlorine. This is our personal preference for our plants and drinking water. There can always be too much of a good thing. This includes microgreens. One research study found that consuming 4 or more cups of broccoli microgreens per day could be a toxic burden for the liver. All things in moderation, even the healthy stuff, please! I consume ½ – 1 cup of microgreens about 5 days a week.